In STALKING THE DIVINE, a Cleveland woman attends Christmas Mass at an old city church seeking holiday cheer and comfort in the trappings of a faith she abandoned more than 30 years ago. Instead, she finds a tiny threadbare congregation and a nearly forgotten group of aging, cloistered, contemplative nuns with a mission to pray day and night for the sorrows of the world. Thus begins a three-year dialogue between the nuns and Kristin Ohlson, who struggles to understand how these women gave up the world–and continue to do so joyfully–for their faith. Ultimately, Ohlson finds that talking to the nuns becomes a way of opening herself up to the possibility of the sacred–which is, in its way, an answered prayer. 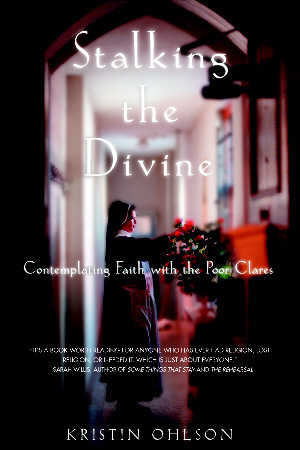 Kristin Ohlson’s STALKING THE DIVINE offers us a fascinating look into a place few ever see: the private, cloistered world of the Poor Clares of Cleveland, Ohio, who pray for the world twenty-four hours a day. We learn how they spend their days in constant communication with God, how they found their faith, and how they keep it. But it is not a story just about the Poor Clares, but the questions Ms. Ohlson asks of herself: What is faith? How do you know when you have it? Ms. Ohlson does a wonderful job of weaving her own personal journey into the story of the Poor Clares. It’s a book worth reading for anyone who has ever had religion, lost religion, or needed it. Which is just about everyone. Kristin Ohlson’s honesty, intelligence, and charm make this book irresistible. A nonbeliever who longs for a convincing spiritual experience, she writes about a community of cloistered nuns: women as honest, intelligent, and charming as she, who have centered their lives around prayer. STALKING THE DIVINE is a delightful story about curiosity, by a writer who can’t be dispassionate about her subject and also can’t lie to herself.